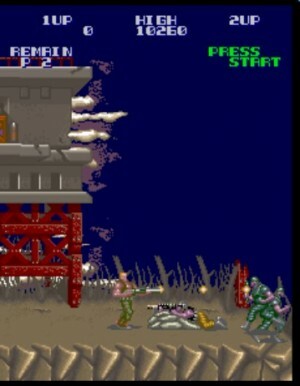 Players control tough commandos equipped with powerful weaponry that run and jump through strange alien lairs fighting against armies of aliens. The game uses a combination of side view and overhead views. Inspired by the Aliens and Rambo movies. December 2634: A year has passed since Bill and Lance defeated the Alien Menace know as Red Falcon. However, Red Falcon is back and this time he has taken over a local military base and its army. Now it’s up to Bill and Lance to take out Red Falcon once again. This game is a shooter with superb graphics and sound. You run through the levels shooting anything that threatens to kill you. Collect power-ups to make your journey a little easier. There are two types of levels: side-scrolling and overhead. The zappers from the tank boss on level two do not seem to hurt you. Getting hit by the wheels does not seem to have any effect either.